When the widely recognized “Father of Science Fiction,” Hugo Gernsback first coined the term that captured the essence of the genre we now call science fiction (SF), he envisioned SF as a new form of literature that inspired with prophecy, taught with scientific and technical facts, and engaged with adventure. These traits unique to SF have launched many of its readers on trajectories into the STEAM (Science, Technology, Engineering, Arts, and Mathematics) fields. Join us for a one-day symposium exploring SF as a medium for engaging imagination, a means for exploring STEM/STEAM fields, and an instrument for discovering interdisciplinary connections, and also celebrating the new City Tech Science Fiction Collection held in the Archives and Special Collections of the Ursula C. Schwerin Library. 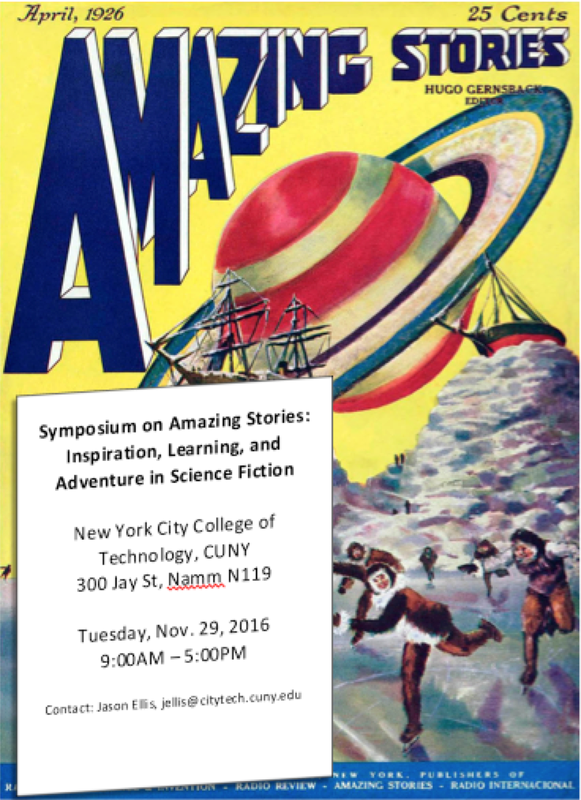 Please send a 100-word abstract, brief bio, and contact information to Jason Ellis (jellis at citytech.cuny.edu) by Oct. 31, 2016. Schedule will be announced Nov.15, 2016. Organizing Committee: Jason Ellis (Chair), Aaron Barlow, Jill Belli, and Mary Nilles.